As any recent weekday visitor to the store will have observed, we have a noise issue at the Bookstore. The underground parking garage beneath us is undergoing a major renovation which involves drilling into the concrete. The noise varies from very unpleasant when they are working directly beneath us to a background rumbling when the drilling is more distant. We have been told that this will likely continue for another two weeks (till Oct 10)followed by a two week break before it resumes. The Building Owners have tried to mitigate the effect on tenants and residents by providing noise free periods from 12-1.00p.m. and after about 3.45p.m. There is no work on the weekends. If you are free to time your visits to the store, that may help. We do apologise for the inconvenience and the disruption for browsers and we will try very hard to provide the same cheerful service as usual despite the irritating impact on our staff! Thank you for your understanding. It was 1921. 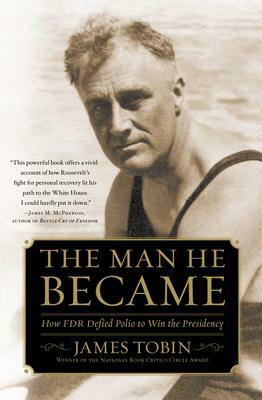 Franklin D. Roosevelt was rich, privileged, had already served in executive positions with the Navy, the Boy Scouts, and was well-known as a leading Democrat and descendant of Theodore Roosevelt, a popular President of years past. And then polio struck. He was 39 years old and completely paralyzed from the waist down. This book by James Tobin gives the up-close story of how this remarkable man fought back and never gave up on his aim to be President of the United States. He did the exercises and eventually found that warm water and sunshine doubled his chances of healing. He bought the resort of Warm Springs, Georgia and helped it become a leading centre for disabled patients. As he began to get some feeling in his legs, he used braces, canes and crutches. He was insistent on keeping his disability as inconspicuous as possible – not from a feeling of pride but because he didn’t want the pity towards “being a cripple.” He was a tall, handsome man with a big head, strong voice, and he laughed a lot, which made people forget his injuries. As the years went by Roosevelt became more and more prominent in Democratic politics and was chosen to be Governor of New York. By 1933 he was President – and the rest is history: the Hundred Days in which Roosevelt fought the causes and effects of the Great Depression; the New Deal. There are many books written about Roosevelt. This one concentrates on the years he fought his own private battle and the effect it might have had on his handling of later political problems. Many thought it made a huge difference to the man himself, making him more conscious of other people, of weak people, of human frailty. His wife, Eleanor, thought it gave him strength and courage he had not had before. James Tobin has won prizes for two earlier books: Ernie Pyle’s War and To Conquer the Air: The Wright Brothers and the Great Race for Flight. This one is an elegant and moving book, gripping from the start with a fine eye for the telling detail. Frances Itani “Tell” In store now. Saturday Sept.27: 1.00-3.00p.m,. Book signing. Mike Young “Kirk’s Landing” Sunday: Sept. 28th: 6.00p.m.Titles@Table40. Dine with Frances Itani. hear about her new book “Tell” and enjoy the gourmet food from Fraser’s Cafe. Advance ticket purchase necessary. Our big event is the celebration of the 20 years since the founding of the store which we are marking on September 13th. This is a tribute to the original founders of the store -Jean Barton and Mary Mahoney- but also to the many staff and volunteers who have contributed to the success of the store during that time. Come in and join us. We are marking the event with a one day 20% reduction on everything that is in stock -books, cards, calendars, games etc (everything except the Globe & Mail!). The sale is for in stock items only and does not cover special orders. Take your opportunity to celebrate too! There are some great 2015 calendars that recently arrived. The Titles@Table40 opening event of the season is on September 28 starting at 6.00p.m. Frances Itani will discuss the background and inspiration for her latest book “Tell” set in the post First World War period. Of course, you also get the famous Fraser Cafe cuisine -a three course meal served family style at harvest tables and you’ll get to meet some of your fellow book-lovers. The cost is $40 and places must be reserved in advance with a $20 deposit. The event is currently sold out. Watch for next month’s announcement. Some of our staff are involved in a fun project in co-operation with the New Edinburgh News. They are busy reviewing classics- mostly visiting some classics which we all should have read but many didn’t. It is quite a challenge to review such well known works. Watch for the results in the NE News shortly. There is a growing trend to re-read the classics. The store has a special section near the back for those interested. The evening starts at 6pm with dinner, followed by the author presentation about her new book “Tell” and book signings. Attendees must reserve their spot at the bookstore with a non-refundable deposit of $20.00 which will go towards the cost of the meal (a set menu with a vegetarian option). The total cost of the meal is $40.00, which includes a three course meal (family-style). No substitutions will be allowed.